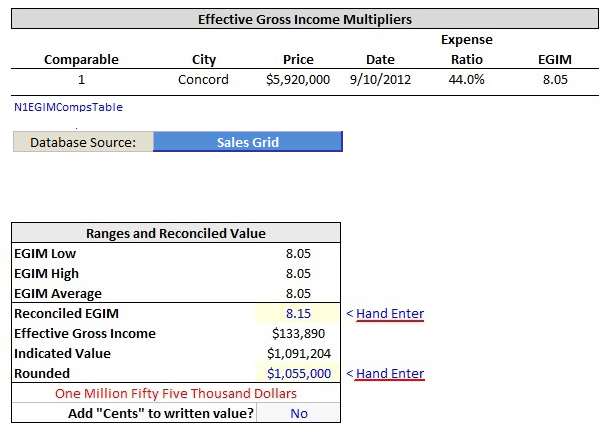 The Effective Gross Income Multiplier (EGIM) and Net Income Multiplier (NIM) analyses are located at the bottom part of this worksheet. Populate Potential Gross Income from Rent Roll sheet. If the Rent Roll was completed, this data automatically populates the Income section. Income projections are developed from left to right, on a tenant by tenant basis, or by unit types, such as apartments. Enter the method of projection. This must match exactly one of the methods from the list at right. Enter the number of units or square foot area, depending on the method of income projection. Note that "$/Year" projections are not sensitive to this input - it can be any entry or left blank. It is a good practice to enter square footage or some kind of descriptor to aid the reader. Vacancy and collection loss is entered as a percentage. Alternatively, the percentage cell can be cleared and a dollar amount entered directly under the PGI amount (requires unprotecting the sheet). Other Income is for miscellaneous income that is not subject to vacancy and collection loss. This works similar to income projection section: enter data from left to right. Enter the amount as a lump sum, per square foot, or per unit dollar amount, or as a percent of Effective Gross Income, formatting the entry accordingly. Enter the method of projection. This table is located immediately to the right of the expense section and automatically populates. A given expense reimbursement will be added to the reimbursement table when 'Yes" is listed in the Reimbursed column (Yes/No can be toggled via double-click). The expense amount reimbursed is automatically adjusted for vacancy/collection loss. For example, if taxes are $12,000 and vacancy and collection loss is 10%, the amount of reimbursed taxes is $10,800 ($12,000 x .9). The total reimbursement is added to the NOI in the Capitalization table. 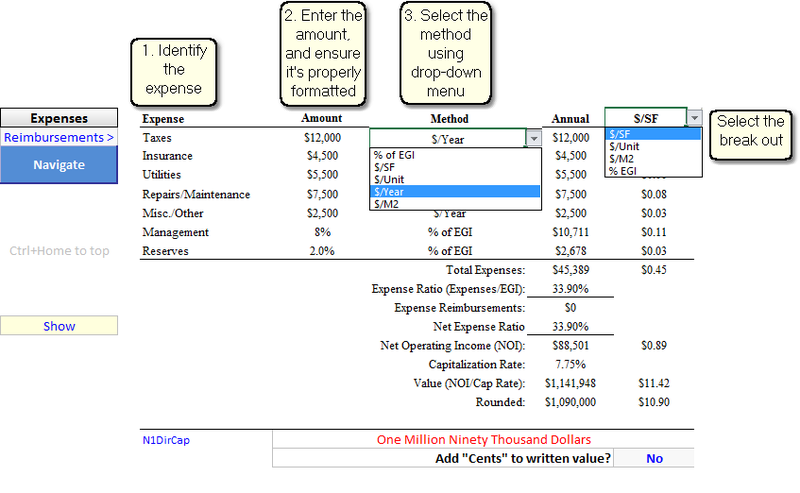 The Net Operating Income (NOI) is calculated automatically (EGI-Expenses). 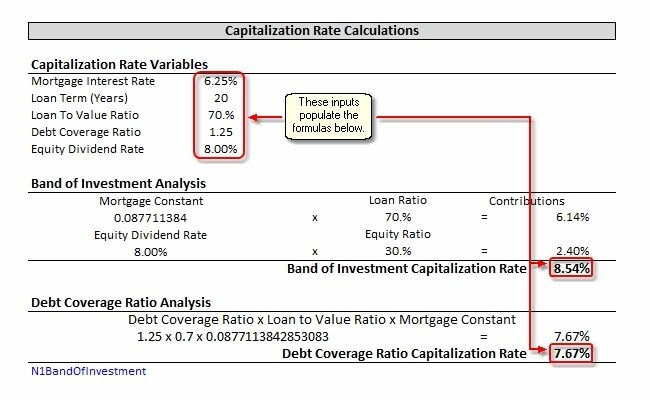 The capitalization rate (cap rate tools are described below) is entered by the analyst, as is the final and the final rounded value. Final cap rates and and values would be inappropriate to automate and are always hand entered to ensure appraiser judgment in the valuation process. The capitalization rate is the ratio of net operating income to sale price, or NOI / Sale Price. These methods calculate from the same set of inputs. The mortgage variables are used to build the mortgage constant (RM), which is the total amount of the payments made in one year, expressed as a percentage of the original loan amount. The equity cap rate is the annual return to the investor, expressed as a percent of the original amount invested. The annual return to the investor is also known as the equity dividend rate; it is the profit remaining after debt service and all other expenses. Note that the equity cap rate is not the same (usually, that is) as the equity yield rate. The equity yield rate reflects the total return to the investor over the life of the investment. Factors such as appreciation and mortgage pay down affect and usually increase this return to a point higher than the equity dividend rate. In markets where substantial appreciation is expected, investors will often accept a low or even negative equity dividend rate, anticipating a compensating payoff when the property is eventually sold. In markets where little appreciation is expected, much more weight is given to the annual equity dividend. Items 1 through 3 are discussed above under the Band of Investment section. Item 4, the debt coverage ratio is the factor by which income exceeds debt on an annual basis. This table is at the bottom of the Dir Cap worksheet. 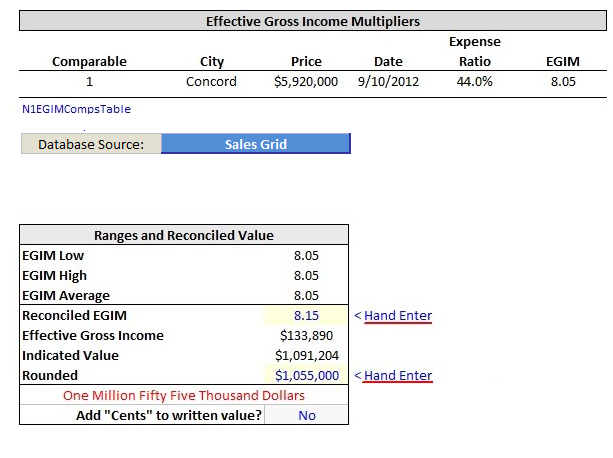 Comparable sale cap rate tables can be automatically populated from comps selected in the Sales Grid sheet, or hand entered (this requires unprotected the sheet and over-writing the formulas). If the cap rates comps are different than those used in the Sales Grid sheet, simply create a second Sales Grid sheet, populate that sheet with cap rate comps, then point to the sheet as the database source for the cap rate table as shown below. Narrative1 notes that EGIM Analysis is often considered a sales analysis method, however, in our view it is more closely aligned with income characteristics and therefor we have the EGIM Analysis part of the income section. This method is popular for multifamily properties. Analysts should be mindful that EGIMs are highly sensitive to expense ratios. Typically, the higher the expense ratio, the lower the EGIM and vice versa. Similar to the cap rate tables described above, the EGIM table can be automatically populated from comps selected in the Sales Grid sheet, or hand entered (this requires unprotected the sheet and over-writing the formulas). As noted above, iIf the EGIM comps are different than those used in the Sales Grid sheet, simply create a second Sales Grid sheet, populate that sheet with EGIM comps, then point to the sheet as the database source for the EGIM table as shown below. This analysis is located directly under the EGIM analysis and is nearly identical in terms of how the tables function. However, unlike the EGIM analysis, the NIM is not sensitive to the Expense Ratio.